Decoteau, of Chippewa decent, was born in Belcourt, North Dakota, on the Turtle Mountain Chippewa Reservation. During his "wonder years," Decoteau attended St. Joseph’s Indian School in Chamberlain, South Dakota. Later, he graduated from Turtle Mountain High School in his hometown. While attending college at the University of North Dakota in Grand Forks, an accident changed Decoteau’s path forever. Decoteau was enrolled in law enforcement classes with designs on becoming a police officer. One day, his car battery exploded. He lost sight in one of his eyes. This accident automatically disqualified him from becoming a law officer. After some soul-searching, he rearranged his priorities. He switched his major to visual arts in 1986. 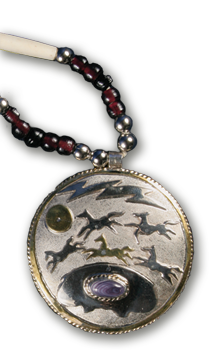 In 1987, he ventured to Santa Fe, New Mexico where he studied as an apprentice to professional stone artisans. He jokingly states he did the “dirty work” for them. In turn, he learned a lot about the basic techniques of sculpture. Today, Decoteau is producing award-winning “block busters.” In his work, he intellectually expresses world-class influences of cubism, abstraction and impressionism to a high degree of sophistication. His creations are a cosmic blend of mastery for multi-configuration stone carving and Chippewa mythology. Like a playwright with a chisel, the bear, the buffalo, the horse and the turtle play center stage in his sculpted legends accompanied by human participants in the sweeping dramatic script executed in stone. With his brother, Alfred, who is also an accomplished sculptor, their work collectively and distinctly has been coined “Northern Plains Style.” Alabaster is their medium of choice. Notably, Decoteau’s work is now part of major collections The Smithsonian Institution, Washington, DC; the Red Cloud Museum, Pine Ridge, South Dakota; Buffalo Bill Museum, Cody, Wyoming; Turtle Mountain Heritage Center; Belcourt, North Dakota and the Akta Lakota Museum, Chamberlain, South Dakota. Decoteau’s awards and honors in sculpture include: honorable mention in the 1989 Arts in the Parks program, Bismarck, North Dakota; a memorable first, second and third place in the 1990 United Tribes Expo, Bismarck, North Dakota, second Place in 1991 and third Place in 1992. In 1991, he placed third in the all-around category at the Orlando, Florida Art Expo. The same year also brought him first place at the Northern Plains Tribal Art Show in Sioux Falls, South Dakota. He topped it all with a first place award at the International Indian Art Expo, Minneapolis, Minnesota. In 1992, he won Best of Show and third place at the Northern Plains Tribal Arts Show, Sioux Falls, South Dakota. He also placed second at the Billings Indian Art Show, Billings, Montana. Decoteau’s character and well-deserved credits speak for themselves. The fateful explosion in 1986 sent his life and his career in a profoundly new direction. His story alone serves as a source of inspiration. The artist and his family currently reside in Dunseith, North Dakota.